While most people look to spring as the season when flowers start blooming in NYC, some plants don’t care that the weather is cold. 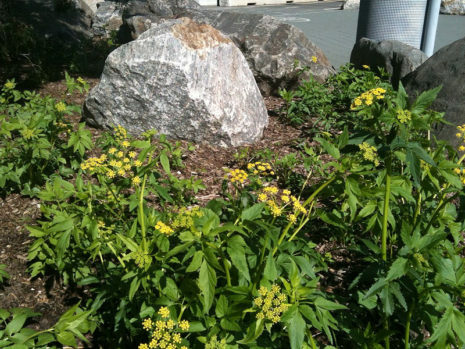 And as it happens, both Madison Square and Stuyvesant Cove Parks are home to a few…and the ones in Stuy Cove are, of course, native species. Zizea aurea, or golden Alexander, a native perennial that can be found across the entire East Coast, from Canada to Florida. It generally prefers moist conditions in woodlands or prairies, and grows in Stuy Cove. Last winter, it flowered continuously! This letter, by Solar One BFF Joy Garland, appeared in the December 28, 2017 Letters to the Editor in Town & Village newspaper. Have you ever wondered how schools are preparing our students from kindergarten through high school to understand climate, how it affects us and what we can do about it? One solution that has been suggested is to reach out to the teacher training colleges who prepare the adult students to be teachers before they enter the children’s classrooms. Here in New York City, Teachers College, Columbia University and New York University are both participating with the New York CityDepartment Of Education (DOE) Office of Sustainability, to increase environmental and sustainability education for teachers and students. There is also an initiative from NYC DOE to strengthen the sustainability coordinator position in each public school. 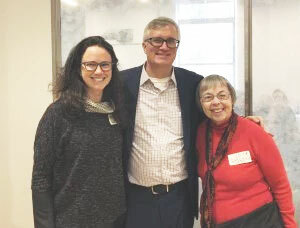 We were delighted that State Senator Brian Kavanaugh was able to speak at the recent meeting of the Environmental Education Advisory Council (EEAC) dealing with the aforementioned issues. The senator spoke about initiatives on the environment that he sponsored when he served in the State Assembly before he won a spot in the State Senate recently. He also offered suggestions for helping to improve environmental and sustainability education in the schools. If you’ve been curious about Solar One’s Here Comes Solar program, thanks to the awesome folks at BRIC TV, you can learn all about it in this informative video. 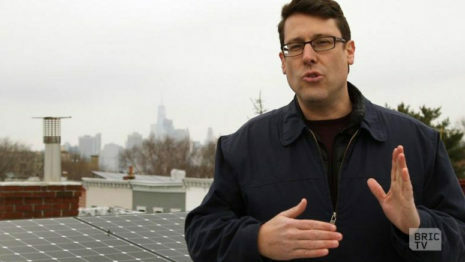 Professional futurist Garry Golden will show you his own rooftop solar array in South Park Slope, Brooklyn, and Here Comes Solar program director Noah Ginsburg explains how the program works and its goal to help solarize Brooklyn…and beyond. Solar One, GRID Alternatives Tri-State and Co-op Power today announced the launch of Affordable Solar New York. The nonprofit initiative will bring low-cost solar power to affordable housing providers in New York, which provide critical housing and services to low-income residents. 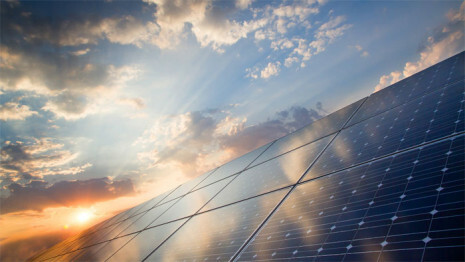 Solar can significantly reduce energy costs for both operators and tenants, yet up-front costs, credit scores and complex financing remain significant barriers for this sector to access the technology. 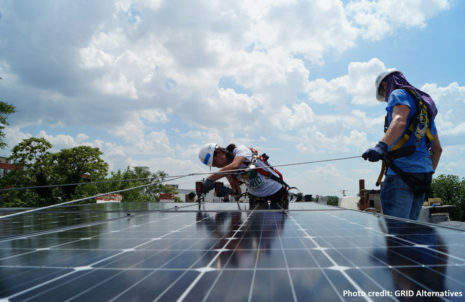 Affordable Solar New York will address these barriers by providing no-cost technical assistance, reduced-cost installation and zero-down financing options to Housing Development Fund Corporation cooperatives and other affordable housing providers in New York City. Projects will include both job training and energy efficiency education opportunities for residents. Solar One’s newest initiative Here Comes Solar helps homeowners aggregate their economic power and physical proximity to “solarize” their communities, one block at a time. Check out this article from DNAInfo that explains how it’s done, how homeowners feel about the process and then go to the Here Comes Solar website and fill out the survey to see whether your home might be a good fit for solar! 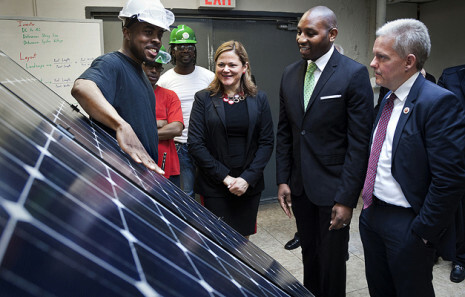 “We’re very committed to creating jobs,” City Council Speaker Melissa Mark-Viverito declared to 26 green job trainees at Solar One’s Workforce Training Lab on Monday. She was joined by the City Council Majority Leader, Jimmy Van Bramer, and Council Member Donovan Richards, Chair, Committee on Environmental Protection. “We must all do our part to make New York a more sustainable City. The Solar One Workforce training program provides needed green job training skills to New Yorkers, and I’m proud to support this important initiative,” the Speaker told our trainees as she toured our lab in Long Island City.